Good morning everyone! It's time for another fabulous Thursday challenge from the Create with Connie and Mary team! This week we have a fun sketch! Once again I kept my card very simple! I also had fun playing with the new stamp set Painted Petals! I mimicked the lines on the sketch by using the stamp images from the set! Be sure to visit the Create with Connie and Mary site to see what the other designers did with this sketch! I hope you will play along with us this week! We love to see what you all come up with! 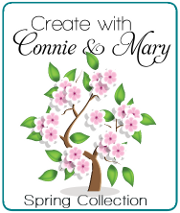 Are you a subscriber to the Spring Collection at Create with Connie and Mary? We are having a lot of fun over there! So many fabulous projects have been shared! You are sure to be inspired! It's not to late to join. Don't miss out on all the fun! Subscribe now! WOW...love the stamped lines beneath the tag! I couldn't think of anything besides DSP to use for the sketch! Great job with the sketch challenge this week! You are a master at CAS cards!! I love your card, crisp and clean. The tone on tone lines and dots is brilliant! 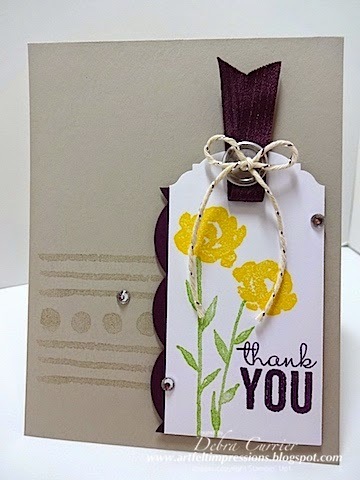 Cute tag and love the stamping on the background! The scallops really bring out the colors used on your tag! Pretty! 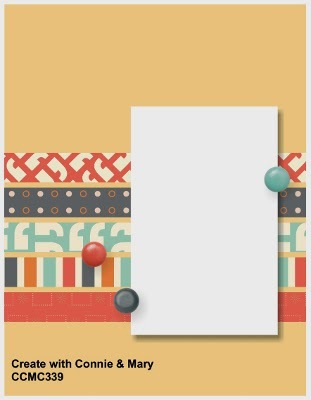 I love the tone-on-tone in place of the paper strips - you are so creative!